Developed and manufactured in the by a leading team of scientists and product engineers and installed by fully trained and approved installers all over the UK, a Topseal GRP roofing system is designed to provide complete waterproof protection for 100-years or more. With more than 1,000 different combinations of colours, styles and finishes available, your finished Topseal installation will provide a sense of perfection and style that only Topseal can deliver. Whether it’s a small dormer or porch, new-build, green roof, historic building, or iconic cutting-edge architecture, Topseal’s versatility will ensure that it fits in seamlessly with your plans. Constructed from the highest quality components, a Topseal flat roof is durable enough to provide waterproofing protection through the worst weather from arctic conditions to desert temperatures and everything in between. The BBA approved materials used within a Topseal flat roof ensures that you can have complete peace of mind when specifying your new roofing system. A Topseal flat roof can be designed to suit almost any specification, with a choice of ultra-modern, hard wearing and stylish options of colours and finishes (including non-slip) that will all protect your structure for decades to come and help to create a superb looking building. We are also able to provide flat roof replacement services where necessary. Your new roof will look great, giving you the style and design that you’re looking for, a proven lifespan in excess of 100 years and all protected with a 25 year materials and workmanship guarantee from your installer. Topseal offers a full range of flat roofing systems to suit almost any application from small domestic refurbishment projects to large scale commercial roofs. 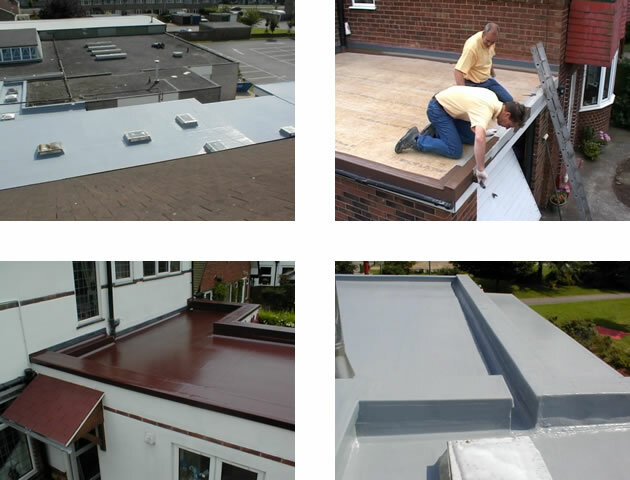 Topseal fibreglass roofing is most commonly used for domestic flat roofs including: extensions, garages, dormer roofs, parapet walls, gulleys, gutters, conservatories/orangeries, traditional or modern applications and tricky detail of any shape or sizes. Topseal roofs are quick, safe and easy to install as a cold or warm roof (with or without insulation) and with a choice of over 1,000 different colour and finish options you can specify the flat roofing materials to produce the look you want. Topseal flat roofing materials are frequently used for large scale commercial projects particularly those with complex and tricky technical detail. Tanking, lining, gutters, gulleys, pipes and any pitch to vertical are all possible with Topseal. Many Topseal glassfibre roofing applications include partial or complete replacement for lead and copper with new roofing systems, including gutter linings and particularly complicated detail work. JEV Group have been trained and approved by Topseal Systems to install the Topseal fibreglass roofing system. In order to achieve approved status we passed a comprehensive training course, which included theory and practical elements for installation with the full range of Topseal flat roofing products, customer service and sales modules which culminated in a final assessment of our performance. Contact us today to discuss your flat roofing installation, repairs and maintenance. With more than 1,000 different combinations of colours, styles and finishes available, your finished Topseal installation will provide a sense of perfection and style that only Topseal can deliver.